TRENDFOCUS recently released its latest quarterly analysis, which showed that 143 exabytes of HDD and SSD capacity shipped in CQ3 on a total of 145 million units. 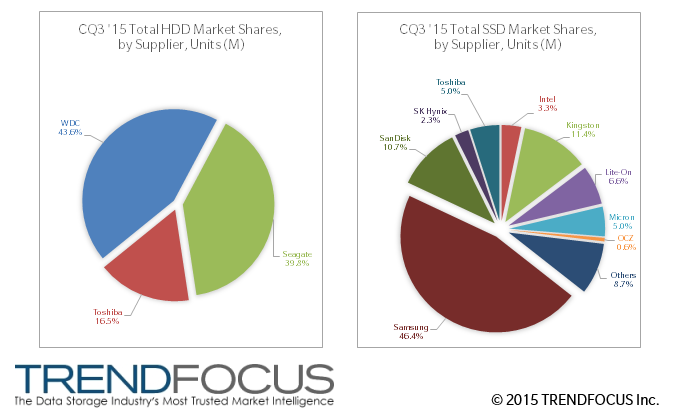 Western Digital and Seagate led the HDD industry, while Samsung, Kingston, and SanDisk topped the SSD market. After a disappointing 2CQ15 for hard disk drives (HDDs), the industry rebounded 7.4% in 3CQ15 to 118.59M units. This increase was due mainly to a sharp rise in CE HDD sales followed by HDDs for client PCs. Western Digital recorded an overall unit share of 43.6%, Seagate 39.8%, with Toshiba in the 3rd position with 16.5%. In the SSD market, unit volumes totaled 26.22M units, an increase of almost 10% Q-Q. As with previous quarters, this growth is driven by the client SSD segment (for use in PCs), which only partially follows notebook PC market trends. Within the client SSD segment, modules (mainly M.2 and ‘M.2 like’) did increase as a function of the slight rebound seen in the notebook PC market. Client drive form factor (DFF) sales also increased as the channel market continued to consume a large portion of the total unit sales. Samsung still dominates in market share both in units and exabytes shipped. Enterprise SSDs sales increased 4.7% Q-Q, totaling 3.1M units. All three interfaces, SATA, SAS, and PCIe, increased in unit volume from the previous quarter. Enterprise SATA SSDs represented over 80% of the total enterprise market. PCIe SSDs finally topped the 100,000 mark, totaling 117,000 units for the quarter. SAS SSDs grew slightly with just over 450,000 units, a sequential increase of 2.3%. The top three enterprise SSD suppliers for all interface offerings, Samsung, Intel, and HGST, represented a combined total equal to 78% of all enterprise SSD units shipped in the 3rd calendar quarter. HDD component markets, specifically disks and heads, recorded higher sales for the quarter; however, flattish client and nearline HDD volumes tempered growth. Looking forward, escalating storage capacities of nearline HDDs will lift disk- and head-per-drive ratios, resulting in possible supply tightness in three or four years time. Please contact TRENDFOCUS for more details regarding our market research and various services. This entry was posted in TRENDFOCUS Blog and tagged CQ3 '15, HDD, SSD. Bookmark the permalink.